By Ryan Whitwam on Jan. 8, 2018 at 8 a.m.
A new switch that aims to make you a better typist. You might not give much thought to the keyboard under your fingers, but there's a community of dedicated enthusiasts who spend a great deal of time thinking about their keyboards. The custom mechanical keyboard community can be confusing and downright imposing, but there are some genuinely cool things out there. In the Keyboard Spotlight, we seek to show off the coolest things happening in the custom mech scene one switch, keyboard, and keycap at a time. This week we're taking a look at the innovative new Hako switches from Input Club and Kailh. These switches are basically an alternative to the Cherry Browns or Blues with which you're most familiar. There are also similar switches from companies like Gateron and Kaihua (Kailh). 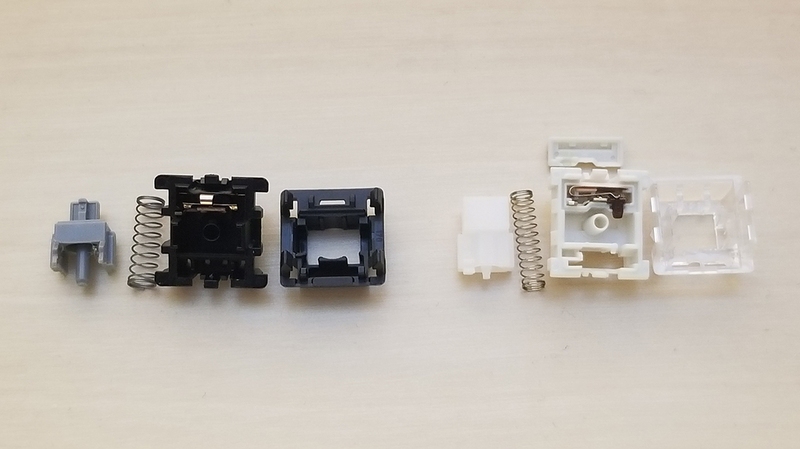 It's become increasingly common for keyboard designers to create custom switch designs and have them produced by one of these manufacturers. The latest to do that is Input Club, which is responsible for creating keyboards like the WhiteFox and K-Type. 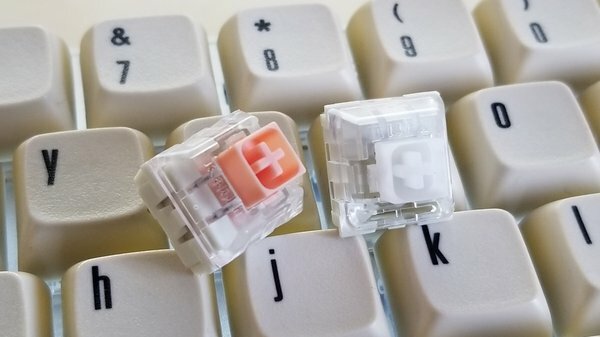 The Hako True (salmon stem) and Hako Clear (white stem) are both based on Kailh's new BOX designs. These switches have a standard Cherry-style cross stem inside a box-shaped frame. So, they work with standard Cherry-compatible keycaps, but the switch housing is "self-cleaning" and IP56-rated. Dust and moisture can escape out the bottom through drainage holes, and the metal contacts are in a separate compartment from the stem—see below for a detailed shot of the Hako Clear. These are both tactile switches, so they have a bump as you press them, but there's no clicking mechanism. The bump comes from the shape of the stem, and the resistance comes from the spring. 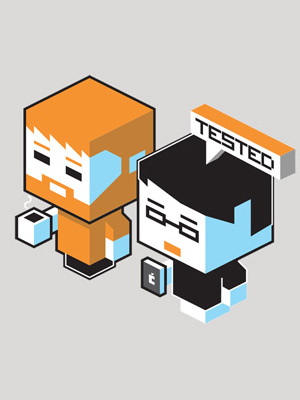 Input Club tuned both components to offer some distinctive properties. As you press the key, the stem goes down and trips a plastic peg in the housing that activates the metal leaf contacts in that separate compartment. This is cool from an engineering perspective, but in practical terms, it means a claimed 25% longer lifespan than Cherry MX switches. The tactile bump is up at the very top of the press, which is unusual for mechanical switches. They've been compared favorably to Topre switches, which use a thick rubber dome and capacitive spring mechanism. The Hako switches aren't as tactile, and the bump is much more drawn out than other switches I've tried. Both Hako switches are weighted in a way that discourages bottoming out. Since all mechanical switches actuate before the bottom, you don't have to press them all the way. In fact, this can be harder on your hands and slows your typing. Most switches have actuation forces that are close to the bottom out force. For example, an MX brown actuates at 45g and bottoms out around 55g. The Hako Clear actuates at 55g and bottoms out at 79g. The Hako True is 60g and 94g. Ramping up the force like that helps you know when to release and move on to the next key. These switches may actually make you a better typist. The Hako Clear and True are really fascinating switches, and I can't wait to build something with them. They're available for pre-order at $54 per 120-pack. These are loose switches, so you need to either build a keyboard by hand or have a board that accepts hot-swappable switches.